…On Friday morning, January 1, Schram invited conference participant Rabbi Jonathan Rubenstein into the inner sanctum of Freedman’s kitchen. Rubenstein lives in Saratoga Springs, New York, where he co-leads a congregation with his wife, Rabbi Linda Motzkin. In addition to the service-leading, spiritual guidance and pastoral care that come with his rabbinical position, since 2004 Rubenstein has run Slice of Heaven Breads, an educational non-profit bakery located in his synagogue’s kitchen. At the food conference, Rubenstein taught a well-attended session on the art of challah braiding and bagel rolling. 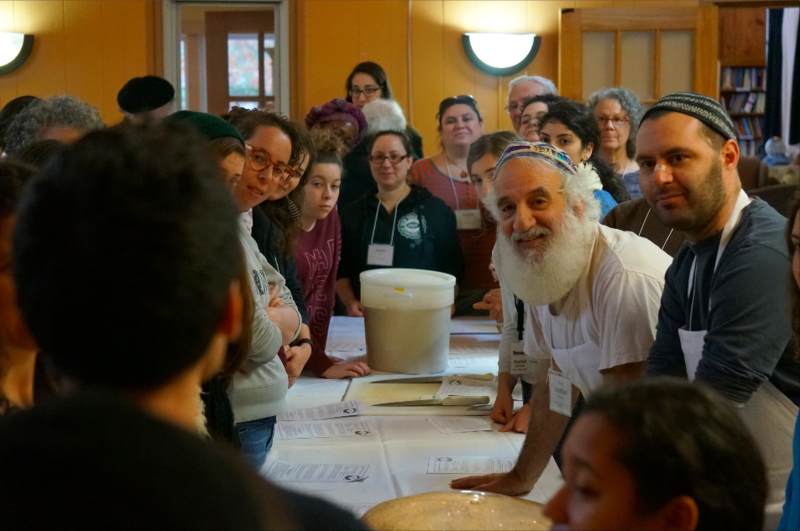 Then, in a gesture of extreme kindness, he and a handful of volunteers rolled more than 150 bagels, which were then boiled and baked for the conference’s goodbye brunch. Sprinkled with poppy or sesame seeds and gently puffed with a chewy crust and tender, yeasty inside, they were as good as any revered New York City bakery’s bagel. They were the perfect thing to eat while welcoming the New Year’s first morning. ← Story Telling is Magic!